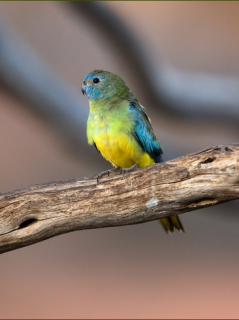 The female Scarlet-Chested Parrot carries green leaves to the nest tucked in its rump feathers. Male-bright green upperparts; bright blue face; scarlet foreneck and centre of breast, separated from orange/yellow lower underparts and undertail; bright blue upper wing coverts; green central tail feathers. Bill black. Eye brown/grey. Female-blue on face paler; blue lores; green breast; pale blue upper wing coverts; varying presence of pale underwing stripe. Bill dark grey. As in adult female with varying presence of pale underwing stripe. Calls made in flight are soft, two-syllable notes. In repetition these sound like chirrups. Birds in flock produce soft, continuous twittering. Emits clear, sharper whistle when alarmed. Parrots: Status Survey and Conservation Plan 2000-2004, Snyder, McGowan, Gilardi, Grajal, 2000. A Guide to Incubation and Handraising Parrots, Digney, 1998. Quite common, particularly in Australia. Walk-in enclosure, minimum length 2.1m (7 ft), or indoor aviary minimum length 1.8m (6 ft). Small seed mix such as: canary, millet, and smaller amounts of oats, buckwheat, safflower and a little hemp; limited sunflower seed; spray millet; green leaves such as: Swiss chard, lettuce, sowthistle, dandelion, chickweed; seeding grasses; rearing food made from: hard-boiled egg, wholegrain bread and carrot, all ground to crumbly consistency; fruits such as: apple, pear and banana; complete kibble. Provide bowls for bathing; if possible provide dirt or soil for the birds to scratch around in (they are ground feeders in the wild), foraging toys/bird-safe branches. Vertical box 6" x 6" x 12" (15.2cm x 15.2cm x 30.5cm). Evidence of decline in Western Australia and New South Wales; world population low. Interior of S Australia, from far SW Queensland, W New South Wales and NW Victoria west to SE Western Australia. Found in a variety of dry areas in the interior of Australia; these include mallee, mulga, open Eucalyptus and Casuarina prevalent woodland. This species also prefers Spinifex ground cover. Feeds mainly on grass seeds. Birds feed on the ground, and frequently drink water from various sources. They form large flocks outside the breeding season; during breeding they will form semi-colonial nesting areas. 4-6 rounded eggs, 23.0 x 19.0mm (0.9 x 0.7 in).